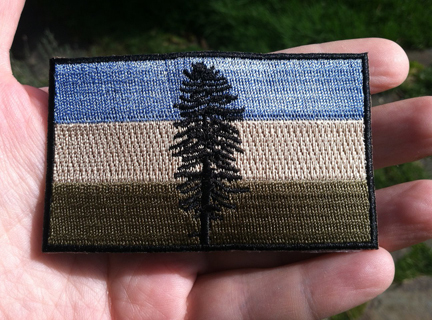 2" x 3.25" Douglas Fir Cascadia flag patch, in subdued colors like those worn on camouflage or battle uniforms in the military. Iron-on backing, but I highly recommend sewing the patch on as well. 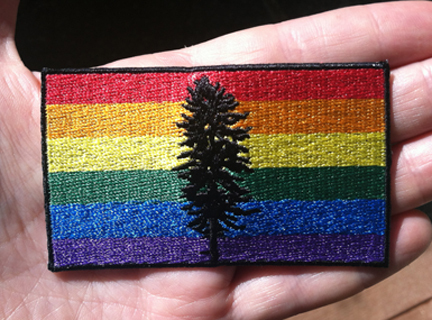 2" x 3.25" Douglas Fir Cascadia flag patch, in the rainbow colors of LGBT Pride or the international peace flag. 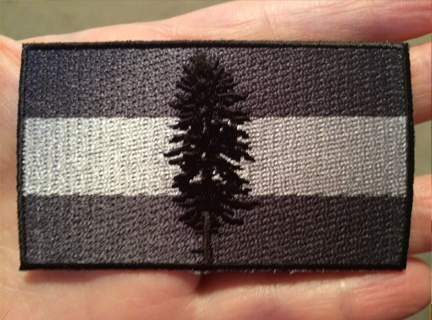 2" x 3.25" Douglas Fir Cascadia flag patch, in grayscale SWAT or Special Ops colors. If you want to split your order, that's fine. Just order four of any style and put a note in the Comments field of the PayPal form saying what four patches you would like. Free first-class shipping on all orders. US and Canada addresses only. Please allow two weeks for shipping, though it probably won't take that long. Contact me at muted.doug@gmail.com with any problems or questions.